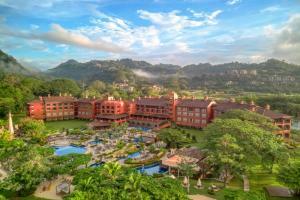 Recognized by Travel & Leisure magazine readers as one of the "World's Best", the Los Suenos Marriott Ocean & Golf Resort is a luxury Costa Rica resort nestled between the warm waters of the Pacific and a 1,100 acre tropical rainforest. A memorable Costa Rica beach resort vacation awaits, gliding from tree to tree on a canopy tour or just sitting back and relaxing along our palm lined free-form pool. 60 miles from San Jose. La Vista Restaurant - Breakfast, lunch, and dinner; Nuevo Latino - Latin American fusion; Arrecife Pool Bar & Grill - Poolside service; La Casa del Cafe - Sandwiches and coffee; Hoyo 19 - Casual lunch; Puesta del Sol - Pub. Arenal Volcano & Hot Springs, Bijagual Waterfalls, Carara National Park, Mangrove and Crocodile Adventure, Manuel Antonio National Park, White Water Rafting.